Along with fire drills, schools have been conducting lockdown drills -- often known as active shooter drills -- since the Columbine massacre in 1999. But safety officials do not agree yet on what teachers and students should do when a homicidal gunman invades their school. 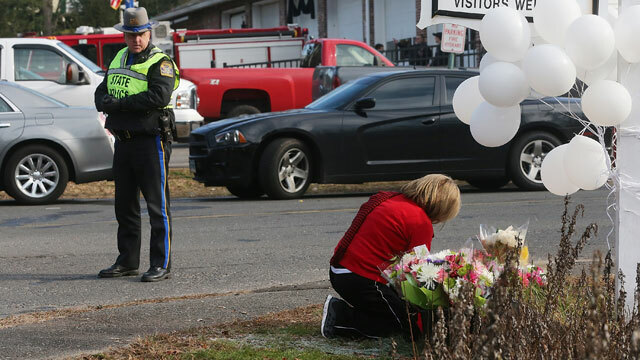 At Sandy Hook Elementary School, teachers, staff and students had been drilled on how to handle such a situation. "We practice it, and they knew what to do, and you just think about protecting the kids, and just doing the right thing," library clerk Mary Ann Jacob said. She said had been drilled to send the kids in the library to a back closet between book shelves, a plan developed in advance. "You have to have a certain amount of fire drills, and evacuation drills, and a certain amt of lockdown drills," she said. "Kids know the routine, and the teachers know the routine, and everyone has a spot in the room where they are supposed to go to." Click here for more photos of the scene. School safety expert Ken Trump told ABC News that he thinks the Sandy Hook teachers did what they could to protect their students. "It does sound as though the teachers did everything humanly possible, down to risking their lives, to protect the children in this Connecticut school," Trump said. The school's principal and five other adults died in the Sandy Hook school shooting in Newtown, Conn.
"Teaching kids to lock down, securing your rooms, and, in some cases, teachers stepping forth to protect the children at the risk of their own lives, is something that we see occurring more and more over the years in school safety," Trump said. He and others particularly praised the actions of first grade teacher Kaitlin Roig, who locked her classroom door and barricaded herself and her 14 students in a locked bathroom. But former SWAT officer Greg Crane told ABC News that he thinks existing lockdown procedures aren't sufficient. "What she [Roig] did was a fantastic move," said Crane, who founded a school safety program called ALICE, which stands for alert, lock down, inform, counter, evacuate. "Was she taught that move? Did every teacher know to lock the door and also barricade it? If that's the case, why weren't other teachers taught that?" Crane asked. Most schools tell teachers to lock their doors and sit quietly until helps arrives, Crane said. Typical are the procedures, obtained by ABCNews.com, outlined by a New Jersey school district that calls their drills "Lock Down Yellow." "Go to the room nearest your location in the hallway. "No one will be able to leave room for any reason. "Silence must be maintained (Use of cell phones are not permitted). "Make sure you are marked present. "Do not leave the classroom until directed by PA System, telephone or by an administrator." But Crane founded ALICE because he believed there was something wrong with the lock down-only policies in most schools. "We've taught a generation of Americans to be passive and static and wait for police," said Crane, whose wife was an elementary school principal in Texas at the time of the Columbine attack. "We don't recommend just locking a door because locked doors have been defeated before," Crane said. "Try to make yourself as hard a target as possible." ALICE argues students and teachers should not be passive and that they should improvise. He even suggests they throw things are their attacker. Crane said 300 schools and universities have implemented ALICE since the mid-2000s, but Sandy Hook Elementary was not one of them. In the days to come, Crane said he will be curious to learn how long it took for word of the shooting to reach teachers before the shooter made it to certain classrooms, and whether anyone had time to leave. He pointed out that the people shot and killed in the Columbine library sat there for five minutes before the shooters entered and shot 18 of them. Crane said standard lockdown drills often happen only once a year, but fire drills happen once a month. When he teaches ALICE courses at schools, teachers often tell him standard lockdown drills involve turning out the lights and sitting quietly for 20 minutes, which doesn't make them feel safe. In response to the Connecticut shooting, police in New York City, Los Angeles, Oakland, and several Maryland school districts stepped up visible school security. +Are Post-Columbine Schools Any Safer?